Although the stock product is not metal, yet the sealing performance is limited due to the grommet type design. The sealing performance has been improved considerably with the super grommet,to suit these engines and has been proven to brliver excellent relibility. The dual sealing method of the bead structure & metal grommet, provides maximum sealing for the coolant, oil & gases around the bore circumference. The bead top pry is made of durable but flexible SUS301. High heat radiation character of SUS301 helps transferring heat of the head and the block to coolant efficiently and prevents heat spots which causes gasket blow. SUS301 is also known for its tensile strength and it helps the beads to keep sealing the head and cylinder which repeat heat expansion and shrink all the time. This structural strength also improves torsional rigidity of the whole engine by improving coupling rigidity of the head and the block. 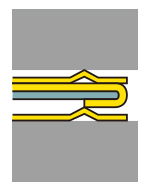 The gas sealing characteristics will improve with the raised rib, but the sealing characteristics of the neighbouring water and oil channels are equally reduced. Therefore when pushing for power gains, these areas are weak points that can allow leakages.The TOMEI design focuses on all areas to provide the maximum seal with the use of the super grommet design. By using the rib height to ensure an equal overall high surface pressure seal, where it is needed the most. 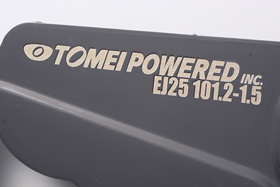 All our metal head gaskets are laser marked with Models, Bores, Thickness, and TOMEI POWERED INC. company name. Since there are similar/counterfeit goods on market, please make sure logos on Gasket.